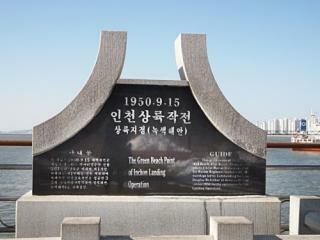 This is the spot where the Incheon Landing Operation started. Through the operation, Korea could get the winner stance through this operation in Korean War. Macathur chose three beach to carry on its plan about Incheon operation. Green beach is one of them. At Green beach, UN armies suddenly attacked Wolmido and started Incheon Operation. Through his operation, South Korea could regain Seoul, the capital and even reached Aplok river.